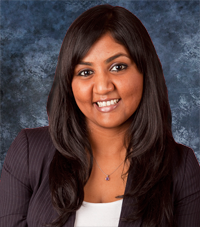 Satisfying customers' needs profitably: can marketing BPO revive marketeers? Back in the '80s, every college kid that wasn't a computer geek wanted to be a marketeer. It's definition was simply "Satisfying customers' needs and wants profitably". The three top dogs in the enterprise in those days were often the CEO, the CFO... and the CMO. That '80s CMO had to to understand the company strategy and have in-depth knowledge of the value of the products and services, while communicating that value to customers. Not only that, he/she had to have detailed knowledge of who their prospective customers were and figure out how to reach them, while convincing the world they had a more desirable offering than the competition. Simply put, the top CMOs were the strategists, the analysts, the go-to-market tacticians and the entrepreneurs all rolled into one super-executive. Somehow, this function lost much of its strategic relevance over the next couple of decades, becoming a morass of (often dysfunctional) processes, data and workflows, with the CMO becoming an increasingly tactical executive, providing fodder for the sales team. Conversely, the cost and importance of marketing has risen as the effectiveness has fallen away. Sound familiar? CMOs have it tough today, whichever geography or market you look at. They’re stretching dollars for myriad activities in a function that’s undergoing major change. The slow recovery from the recent credit crunch has only made the job tougher for marketers. Rising pressure on company profits has increased the need for companies to renew focus on issues such as pricing strategies, customer buying behavior, campaign management, and customer engagement. - Delivering value to empowered customers by bridging the digital divide and getting to know individuals as well as their markets. This also means implementing new technologies (e.g. to handle big data, mobile apps, social media) and advanced analytics to understand and predict buying behavior better. - Fostering lasting connections by focusing on online and offline community building to manage the customer lifecycle better, and developing strong ‘corporate characters’ that employees can internalize. - Capturing value and measuring results, which is where the dreaded marketing ROI is tackled through financial analysis, internal and external resource allocation and analytics adoption to measure and act on the results of marketing programs better. These are ambitious plans indeed, and they’re not going to be implemented overnight. Checking everything off that list will call for a broad multi-disciplinary team working on several new processes and technologies. This isn’t something that every marketing department can maintain successfully. And here lies the strong case for external help that CMOs can seek today, and the opportunity for outsourcing service providers. Outsourced functions such as finance and accounting, human resources and customer service have become industry norm in the last decade or so. At this critical stage in the maturity of the outsourcing industry, buyers and sellers are both posing questions about the next big function – can marketing make the cut, and be moved out of the organization? 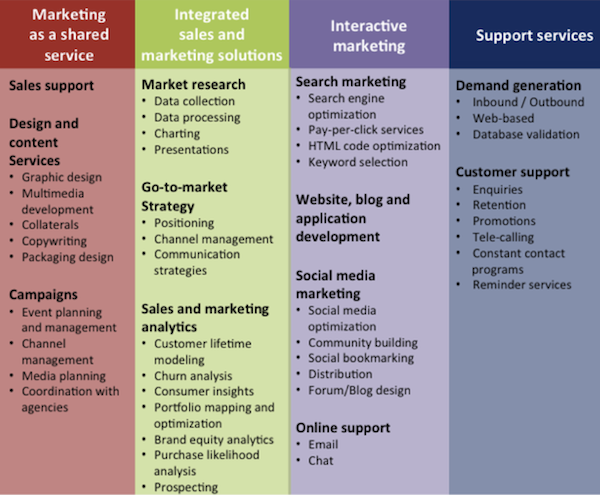 We decided to find out, in our new study, “Marketing BPO Services: Solving the CMO’s Dilemma”. The truth is, marketing departments traditionally already outsource a portion of their marketing function (though this may not be construed as such)– advertising, some promotional activities and event management. Over the years, the services outsourcing industry has started to fulfill demand for a lot more support services under the broad ‘sales and marketing BPO’ category, including customer support and demand generation. The outsourcing of marketing as a horizontal service is in a very nascent stage currently. However, given the increasing pressures for CMOs we just discussed, we believe the scope for outsourced marketing services has expanded exponentially, as the image elaborates. Now, are companies queued up for miles today, demanding these new fangled ‘integrated sales and marketing solutions’? The short answer is, in comparison with other outsourced services demand in the next year, no. As recent research shows, 25% of the marketplace currently outsources - or intends to evaluate - marketing outsourcing opportunities in the next 12 months. 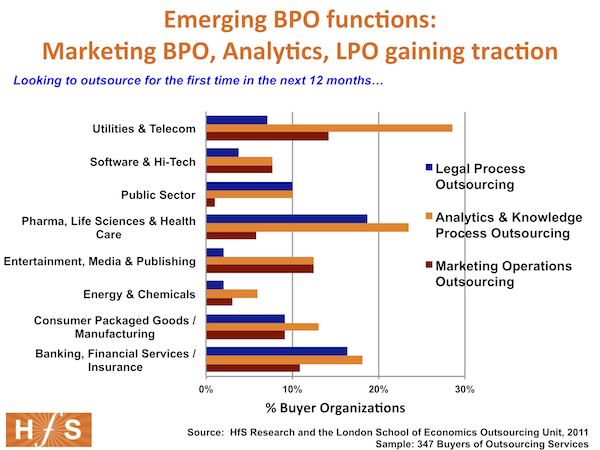 Moreover, we are seeing first-time-buying intentions in the utilities, media, financial services and consumer goods industries, which roughly 10% of organizations expecting a first foray into marketing BPO services over the course of the next year. The IBM and EIC study corroborates this, with highly pronounced future intent (next 3-5 years) for external partnerships for lead management, customer and data analytics and direct/relationship marketing, followed by IT, call or service center management and tracking and measurement. It will be some time before these services are structured and formalized in the same manner as other horizontal offerings such as Finance and Accounting and Human Resources. Strategy teams for service providers are trying to place their fingers on the best approach to this vastly untapped market. The two crucial investments for these services include the right talent and technology/infrastructure. The high level of creativity and judgment in these activities necessitates the need to have people with a strong background in marketing, advertising, campaign management and other allied activities. High-end services within marketing require a lot of investment in the correct tools and technology to work on custom process frameworks and delivery for functions such as design, content management, analytics and database management. The larger service providers often start with the “big ticket” items such as technical support, customer support and F&A before offering marketing services. These services will be outsourced only once trust has been built up between the client and the service provider (and even then, we’re talking about piecemeal deals currently). Buyers and service providers are likely to show more interest in the category as service offerings mature and buyers start to take stock and implement long term plans to transform their marketing activities. You can download "Marketing BPO Services: Solving the CMO’s Dilemma" for a limited time at our BPO Resource Center.